Just fixing your eyes makes alot of difference! I am prone to dark circles because my lifestyle and energy pretty much channels at its best at night, which it guess it's somewhat unhealthy in-a-way. Also because my skin is more sensitive toward pigmentation, i believe it contribute to my weaker periorbital skin - better know as the skin around our eyes which alot of studies have shown that they are 10x thinner than our skin and requires much tender loving care. Last year, I won a lucky draw from Breeze's 10th Birthday Party, which was a RM150 voucher for JUST products, heard of the products through some friends but wasn't really into it because of the price point, which was on a higher end as i know i could not have sustained a regular purchase. Alison for Kota Kinabalu's representative was very friendly and i really appreciate her sincere and nice personality during the sharing session as we did a trial session to see which product i was interested in for the brand. 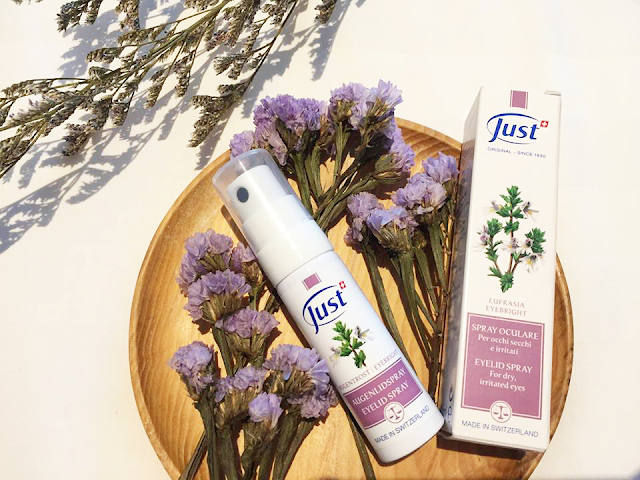 As the products are flew in directly from Switzerland, the brand actually carries quite a recognition for its product ingredients and a lot of feedback are positive on the usage and results! especially for their herbal creams and skincare line. feel free to check out their website for more information on particular products at http://www.justswiss.co/ for more information. THE TEXTURE feels like mist/water as it comes with a spray tube. I usually spray it on my fingers and then dab it on my eyelids because of the watery texture, absorbs quite well. 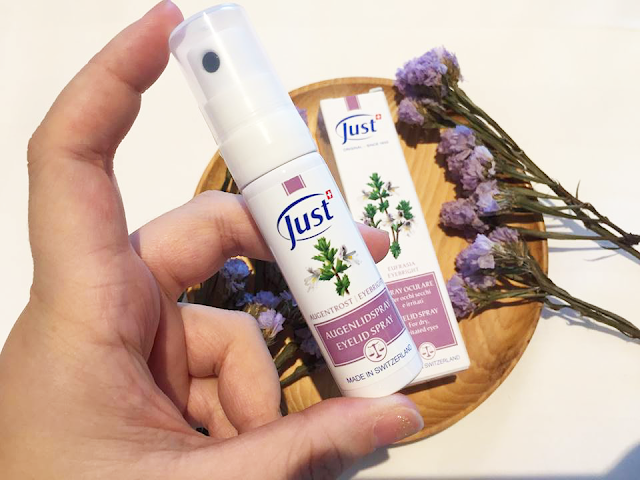 THE SMELL has the light scent of Euphrasia Flower, which is the 2nd main ingredient in the list after Water, which is a herbaceous flowering plant known for treating eye infections. THE AFTER-FEEL it stings a little if it get caught in your eyes or the inner parts of the eyelid. but overall does hydrates the eye area because you will feel the eye area much softer, and you'd feel much more refresh cause it has a minty feel to the eyes upon applications and then goes away quite fast. 1 spray is honestly quite alot. REPURCHASE? i only use it in the morning routine after my toner and before my eye cream, so it will last me longer. even though i probably need it much more often than that morning spray. but the cost of a small 20ml spray to me at RM148 is sadly too expensive! if it wasn't for the voucher, i don't think i'd ever buy it on my own. 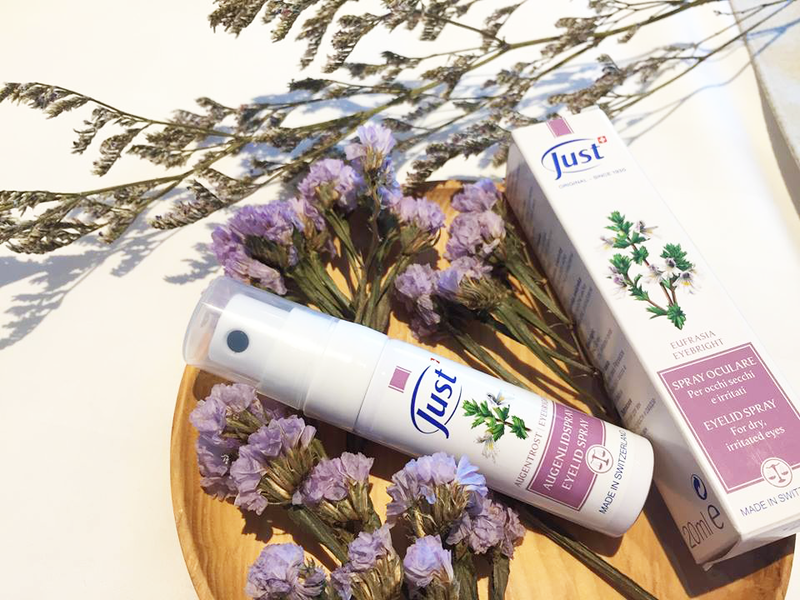 Hence, I don't think i'd be able to repurchase this because of the costs but will consider on their herbal creams instead - they might be more worth it and helps tackle skin conditions better. 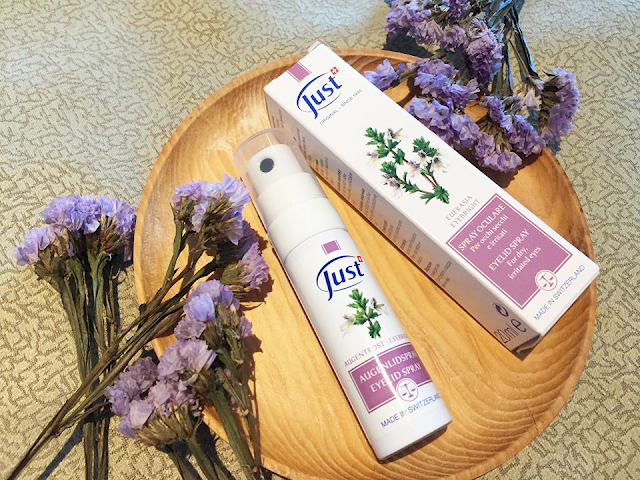 hey guys, those are my thoughts on the Eye Bright Eyelid Spray by JUST! they are quite popular with their wellness herbal creams which i had the chance to tryout during a free trial session. 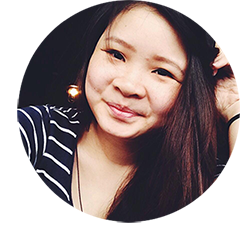 That i think might be more suitable on a more daily use catering sensitive skin types and certain issues towards your skins.